The journey of Antioch Community Church from beginning until today is a story of simplicity and devotion to Jesus—a story of tremendous power, courage, and spiritual success. It’s a captivating and stirring story of literally tens of thousands of lost people coming to Christ. So what’s their secret? The truth is Antioch is not doing anything new; everything they strive to become is straight from God’s Word. What’s unique about Antioch is their passion for Jesus and their sold-out commitment to pursuing His purposes. 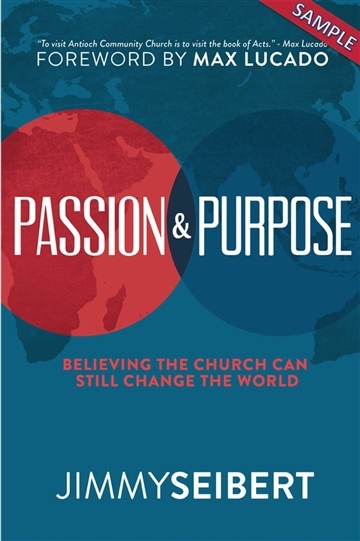 Passion & Purpose is about the people of God—His church—passionately pursuing Him and being deeply committed to His purposes. Nothing more. Nothing less. But the results are changing the world! This is a story of people who believe that the Church is still God’s vehicle to change the world. Jimmy Seibert is the senior pastor of AntiochCommunity Church in Waco, Texas, as well as the founder and president of Antioch Ministries International (AMI). He has served the Antioch church in that role since its establishment in 1999. Jimmy is passionate about loving God and making Him known in all the earth. He and his wife, Laura, have been involved in training and sending out church planters for more than twenty-six years, seeing hundreds of Christians go to the mission field. Their desire is to see the local church own the vision of establishing churches throughout the earth. Throughout his humble journey of simple devotion and obedience, Jimmy, Laura, and those who have served with them at Antioch have been overwhelmed by the Lord’s faithfulness, goodness, and power. Under their leadership Antioch Community Church has grown and impacted Waco, Texas, and planted churches in the U.S. and around the world. Jimmy and his wife, Laura, have been married for twenty-seven years. They are so proud of their children: daughter Abby and her husband, Kyle Van Hecke, daughter Lauren, and two sons, Caleb, and Daniel. mobilizing and discpling believers to impact a lost world for the glory of God.